Infrastructure makes worlds. Software coordinates labor. Logistics governs movement. These pillars of contemporary capitalism correspond with the materiality of digital communication systems on a planetary scale. 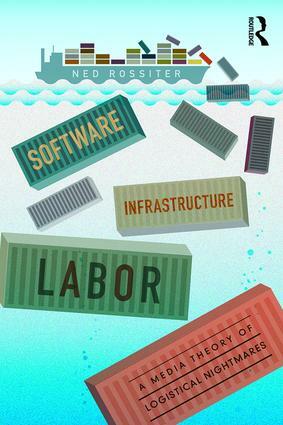 Ned Rossiter theorizes the force of logistical media to discern how subjectivity and labor, economy and society are tied to the logistical imaginary of seamless interoperability. Contingency haunts logistical power. Technologies of capture are prone to infrastructural breakdown, sabotage, and failure. Strategies of evasion, anonymity, and disruption unsettle regimes of calculation and containment. We live in a computational age where media, again, disappear into the background as infrastructure. Software, Infrastructure, Labor intercuts transdisciplinary theoretical reflection with empirical encounters ranging from the Cold War legacy of cybernetics, shipping ports in China and Greece, the territoriality of data centers, video game design, and scrap metal economies in the e-waste industry. Rossiter argues that infrastructural ruins serve as resources for the collective design of blueprints and prototypes demanded of radical politics today.